a handheld diagnostic device that emits ultrasonic waves into the body. Reflection of the waves by a moving structure causes a change in their frequency. 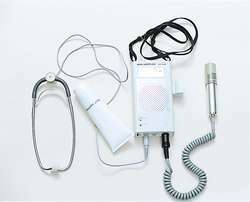 The Doppler probe has been used as a diagnostic tool since 1960 to study changes in blood flow in arteries and veins. Systolic blood pressure By noting the pressure value at which the first pulse sound is heard when a sphygmomanometer cuff (just proximal to the pulse point and inflated to a level that obliterates arterial sounds) is deflated. A coupling jelly was placed on the abdomen, and the Doppler probe was placed over the fetus. A combination of internal monitoring with an implantable Doppler probe and clinical monitoring to assess flap viability has been the recent technique of choice (Wax, 2014). When the Doppler probe is directly over an obstructed vein, no spontaneous signal will be detected. VTI offers the new Flexible Drop-In Doppler Probe for use in laparoscopic and robotic procedures for positive identification of vasculature. Movement of skin beneath the Doppler probe results in a biphasic Doppler shift as skin is stretched beneath at the beginning of each movement and recoils at the end of the movement. 5 g/kg, ip), fleeced with cut machine, equipped with probes for measurements of the rectal and skin temperatures and with a laser Doppler probe for measurement of the skin tissue blood flow. Modern advances in fracture treatment, avoidance of over-tight splintage, the availability of vascular tree visualisation with arteriography and the Doppler probe and surgical reconstruction or replacement of damaged arteries have made this condition less common, but sadly it still occurs. Apart from preinsertion localization of radial artery, a further refinement of this technique, the Doppler probe can be held over the artery throughout cannula insertion; the exact position of the artery is identified by a change or loss of Doppler tones as the cannula contacts and compresses the artery12,13 . Using a hand-held Doppler probe, all the perforator vessels around the point D were detected and marked on the skin. The ABI is also a reliable method for screening leg pain, ischemia of the legs, screening for atherosclerosis and the evaluation of vascular compromise in patients with trauma of the lower legs (Grenon, et al, 2009) The only tools required for the testing are a blood pressure cuff and a continuous wave 5 to 10 mHz Doppler probe as well as a skilled technician. They reported that the Doppler probe located the axillary artery and detected the turbulence in the blood flow after the insertion of an intra-arterial needle: an excellent block was obtained by injecting local anaesthetic under ultrasound examination (4).